These have been specially redesigned with a smaller core to fit these smaller terminals! 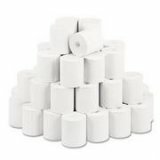 Individual new rolls of 2 1/4" x 74' thermal paper designed to fit 50' roll terminals! Although 74 feet, it will Also Fit Other Terminals which use the standard 2 1/4" X 50' rolls.